Nature's alarm clock! Wake up! The chicken is perhaps the most widespread avian species in the world - and the exotic Red Jungle Fowl is the ancestor of the hybrid Araucana and Rhode Island Red. 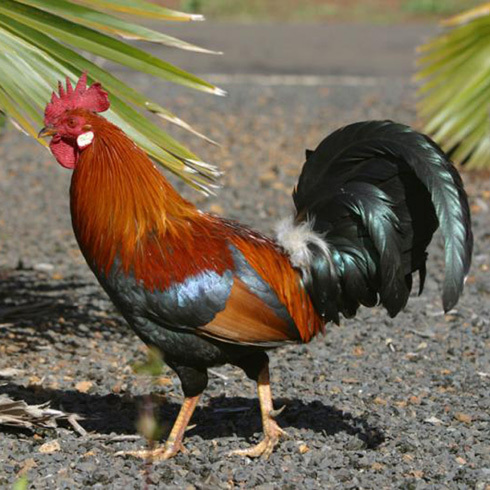 Scientists postulate that chickens were first domesticated from jungle fowl in India, about 5,000 years ago. Traders and travelers then carried them far and wide. Find your local Audubon and learn more about wild birds. To see - and hear - a rooster crowing, be sure to watch the video! You won't find a rooster on next year's BirdNote calendar, but you will find a host of other beautiful birds. More at birdnote.org. You maybe wouldn't think it, but the chicken is an extremely well connected bird. I'm Mary McCann, this is BirdNote, and this – [Call of the Red Jungle Fowl] …is an exotic Red Jungle Fowl. From DNA analysis, scientists postulate that chickens were first domesticated from jungle fowl in India, some 5,000 years ago. Traders and travelers then carried them far and wide, to Asia Minor, Africa, and Europe. Julius Caesar is said to have noted that the Britons “kept them for pleasure, but not for the table.” The farming of chickens for their meat and eggs developed later, until today, when the chicken is probably the most numerous avian species in the world. You won't find a rooster on the 2018 BirdNote calendar, but you will find a host of other beautiful birds. Find it at BirdNote.org. Calls of the rooster and alarm calls of the hens recorded by C. Peterson.